With our Creative Unions exhibition now open at Central Saint Martins, we take a closer look at the themes and works which comprise the show. Starting with fixed, transitory and informational territories, the projects in the Shared Territories section of Creative Unions, explore human connections to place and community. They examine how a landscape, structure or institution can inform personal and collective identities – whether they be constructed, imposed or suddenly taken away. While they often return to their own origins and stories, these designers also reveal the universality of belonging. Encompassing sites of both conflict and comfort, these projects examine how territories are shaped by collaboration and cohabitation. 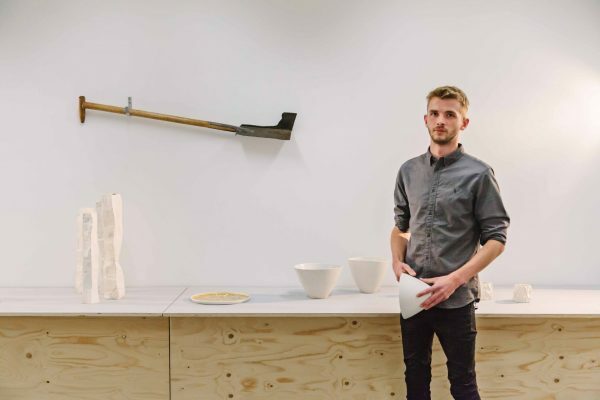 BA Ceramic Design graduate Simon Kidd’s practice is deeply influenced by his childhood in Northern Ireland. 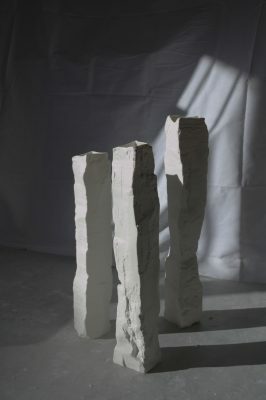 Growing up at the end of the conflict, his recollections are mostly of beautiful landscapes – “bomb scares and helicopters were merely a distant memory.” Evoking a sense of what it means to be Northern Irish and embedded with natural materials and processes, Kidd’s ceramic objects are symbolic of the country’s beauty as well as its complex past. Here, we interview him about his project on view in Creative Unions. Your recent project Sliabh Dónairt and Dregish explores two locations in Northern Ireland. Can you explain why you have selected these locations? I feel that both of these places hold importance for Northern Ireland. Sliabh Dónairt is the Irish spelling of Slieve Donard, which is the tallest peak in the Mourne Mountain range in County Down and the tallest point in Northern Ireland. Its geographical location is also significant as it sits between Belfast and the border to the Republic of Ireland, and could be seen as a view point across the two countries – a witness to the experiences of the people across the ages. Dregish is a bog in County Tyrone – the county which experienced the single greatest loss of life during The Troubles in Northern Ireland. Dregish Bog is an example of a raised bog – one which has developed naturally over thousands of years. Many raised bogs began life after the Ice Age and are now delicate ecosystems, playing host to an array of species of fauna and flora. Bogs are also important sites due to their use throughout history as burial grounds, dating as far back as 4000 BC. In distant history Celtic Kings are believed to have been sacrificed and buried in bogs to appease the Pagan Goddesses of the land. They have also been used in much more recent history as sites for shallow graves for people executed during The Troubles. Can you talk a bit about the materials and tools you use – where they come from and how you work them into your objects? For all of my pieces I have incorporated either a material or a process that is connected to a location. The Ground pieces in the Sliabh Dónairt range incorporate waste granite collected from the area surrounding a quarry on the side of the mountain. I collect this granite by hand before it gets calcined in a kiln (fired to 1000℃). This process breaks down the bonds within the stones and allows it to then be ground down by hand into a fine grit. The ground granite is wedged into a porcelain clay body before being thrown into bowls on the potters wheel. Once fired, the different materials which make up the granite melt and bleed into the glaze on the interior or melt out and bead on the unglazed exterior. The granite becomes a fundamental part of the piece, and therefore the work is forever tied to the location. The other pieces in the Sliabh Dónairt range, Cut no. 1–3, incorporate a process which reflects on the mountain. 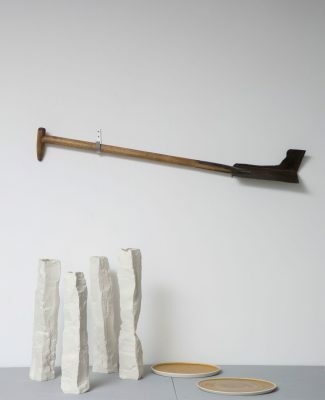 These pieces are slip cast in porcelain and their models are created by chiselling and clamping plaster blocks. This aggression and force are a reflection on the same violence we have shown the land; the defacing of the land for nothing more than what it’s made from – granite. Dregish follows the same pattern as Sliabh Dónairt. The pieces Dug no. 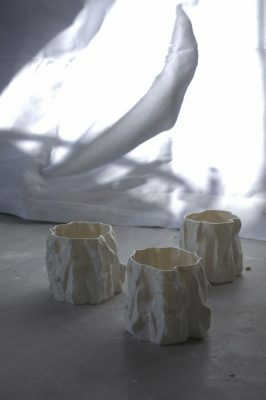 1–5 are also slip cast in porcelain. 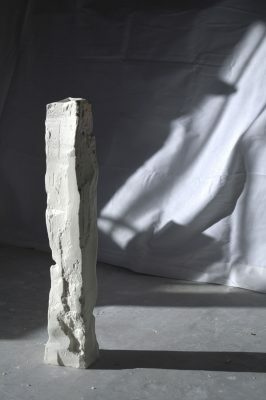 Their models are created by cutting a large piece of plaster right before it sets with a tool that replicates a sleán – a traditional Irish spade used for cutting turf. This process captures the visual characteristics these tools leave behind while creating pieces much larger than a usual piece of turf – objects which stand tall, proud, and pure amongst the bogs. The other pieces in the Dregish series are Burnt no. 1 and Burnt no. 2. These pieces incorporate the burning of the turf in two different ways. For Burnt no. 1, turf was cut and dried in County Tyrone before being burnt in my family home in Belfast. This is the intended use for the cut turf – to act as a fuel source. The ash created by the turf is then collected and processed before being mixed with a number of other ingredients to formulate a glaze. The turf ash is what creates the surface of the glaze. The other ingredients used ensure that it melts and behaves well in the firings – they do not interfere or change the colour, that is all determined by the chemical composition of the ash each piece of the turf leaves behind. Burnt no. 2 also incorporates the burning of the turf, but in a rather different way. These pieces are made to finish before going through an extra firing where they are packed into saggars alongside pieces of turf and fired to 1000℃. At this temperature the turf burns away and leaves markings on the pieces – both within the glazed surface and on the unglazed base of the piece. There is a clear interest in your work and research about the ideas of ruins and remains and the layering of time. You turn these references into functional, recognisable objects. Why is it important that the objects you create retain these functions – that they can be used rather than simply looked at? I think clay is an incredible material because of its the endless possibilities, but also because of the place it holds in all of our hearts. Every household is filled with ceramic objects, plates and mugs and everything else. We all have a connection to these functional objects, we all have memories attached to a certain piece or moment. I wanted to embrace that connection we have to functional ceramic objects and allow it to add to the narrative of the pieces. You write that your experiences of Northern Ireland, growing up at the end of the conflict, significantly differ to those of people older than you, who knew a different country. Do you want your objects to play a different role for these people – perhaps as a reminder or symbol of beauty in place of hatred? I grew up during a time of massive change in Northern Ireland which meant that my experience there was much more peaceful than those only a number of years older than me. I want these pieces to hold a narrative which, although it reflects on negative aspects of Northern Ireland, is overall a celebration of the beauty of the country. The land around us, no matter where in the world, is beautiful for so many reasons. I would be so happy if my pieces acted a reminder of how beautiful it is even when people can be filled with hatred. 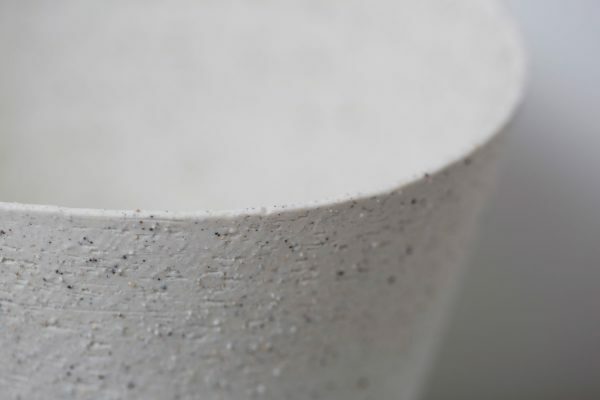 Do you think you are drawn to ceramics because of its mineral, mercurial nature – and its connection to the erosion of nature and land? I have always been interested in materials. One of the things about ceramics I find most amazing is the experience of making for both the maker and the object, how your emotions will be felt by the piece in ways unintended. The materials are also pretty incredible – the fact you can go and collect different materials from the land which can be used directly or incorporated to create work with such permanence and power. 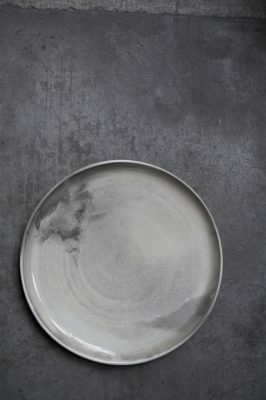 What is it about ceramics that you think allow for such an engaged exploration of human connection and experience? 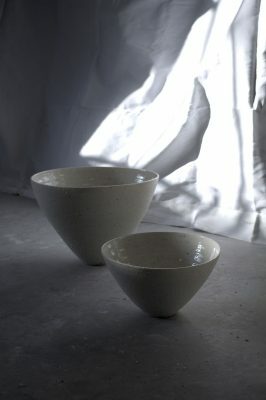 I think that the fact ceramics, as well as so many other forms of craft, are used so much in our daily lives makes them accessible to everybody. As people we are used to the material. It is very familiar, whereas other mediums which are traditionally connected more to fine art, may be slightly more alien to people. Is this an ongoing project? Will you turn to other locations for your next series of objects? There are so many locations across Northern Ireland and the Republic of Ireland which are of incredible importance to the history of the country, and I’d love to gradually explore all of these. These two specific projects are on going for the time being as there is so much more that I’d like to do with them. What are your plans now you have graduated from Central Saint Martins? For now, I’m staying in London, it’s definitely where I need to be. I’ve been continuing my practice in my studio in Brockley, working on my two degree show projects and have been developing them further. I’m also showing in a couple of galleries and an open house and a craft fair this winter so it’s all really exciting. I’m over the moon that I’ve been able to keep on making my work.